A good set of wine glasses is “a must” in order to get full enjoyment from any bottle of wine, be it bargain wine or a wine at the very high end. All our members of the Vintage Wine Tasters have a nice selection of wine glasses that we use for our bimonthly blind winetasting events. Here is the real dope on wine glasses and where to find the best deals. In short, you want a wine glass to be clear with a medium-to-tall tulip style bowl. This is your “go-to” wine glass for red or white wines. Yes, you can purchase the expensive Riedel wine glasses for Bordeaux wines, Burgundy wines and Chardonnay wines. Riedel says drinking wine in a certain-shaped glass brings out the best characteristics of that particular varietal. If you want to go this route, you will be spending a small fortune on glassware and that would cause you to dig deep into your wine budget, thus forcing you to buy even cheaper wine. You can find reasonably-priced glasses at any of these brick-and-mortar stores. For those stores that sell online, you might even find a greater selection and a better price there. Cost Plus World Market always has a variety of wine glasses in their stores or online. The prices are very reasonable and the quality seems to be very good. This is where you most likely will get the best deal in wine glasses. The trouble is they don’t always have the same set of glasses from one week to the next. If you see something you like, you’d better grab it. At my local Costco, they had a large stock of stemless wine glasses for $12 a dozen. Riedel invented this style of glass and it has become very popular. A week later these wine glasses were sold out. Target has a surprising selection of wine glassware in stock, including a line of the Riedel glasses. They also have a selection of Libbey wine glasses. These are the glasses we use when we entertain. You can also purchase wine glasses at the Target online store. Crate & Barrel always has a nice array of glasses in style and in price. They also carry a line of glasses that are made for specific varietals of wine. Before you head out to your local Crate & Barrel, go to their online catalog to see what is offered. If you happen to like shopping at Ikea, then by all means look for reasonably-priced wine glasses there. They have all types. 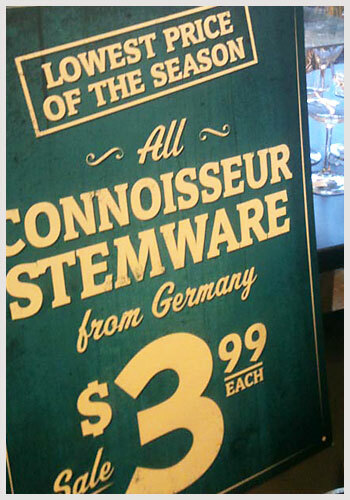 BevMo carries a line of Libbey glasses as well as a brand called Wine Lover’s White and Red. These are $5.99 each, but are currently on sale for $4.00. These are very nice-sized glasses and are well made. These are the glasses we use for our dinner every night. What about plastic glasses for big gatherings? Unless you are pouring some really bad wine, forget about it. We like to entertain and often have big gatherings. Under no circumstances do we serve our good decent wine in plastic cups or glasses. Treat your guests with good wine and good wine glasses. If you have a swimming pool, that is another story. Get some sturdy plastic wine glasses. New wine glasses look so bright and clear. After one glass of wine, the trouble begins. Do not use soap to clean wine glasses. In the next few days, I will post an article on the best way to keep your wine glasses looking like new. You won’t believe it! Let us know if you find a good deal on wine glasses. Post in our comment section. If you are a first-time reader, please sign up in the subscribe box to get all our blog articles via email. You’re right, regarding IKEA, Joe, though the quality varies. There have been some superb French glasses sold there, and some mediocre glasses from elsewhere. It’s likely a matter of when you show up and what’s in stock. Marshall’s also has some very good glasses, but the quantities seem limited and supplies inconsistent. I bought 4 of the glasses at BevMo that are on sale for $4. What a deal! The glasses are perfect for just about any wine and are sturdy, though delicate looking. They’re appropriate for everyday or formal dinner parties. I’m going out on a limb here about plastic glasses. I’d never use them unless entertaining outdoors – lost too many glasses that way. There’s a brand of stemless plastic called GoVino that look good and avoid the risks with glass. Again, rarely used, but happy to have a few sets. We have a pair of these in our picnic basket. They are so much better than the plastic cup. I recently visited the dollar store to look for glass labels for a wine party, after just leaving the local restaurant supply store buying two cases of good quality wine glasses. The little voice in my head kept telling me to go over and look at their glassware, but of course I stood in line trying to ignore the voice as usual thinking; I know everything and there would be no way the dollar store would have anything remotely close to what I had purchased for almost $40 a case (24 glasses). An older lady with a basket bumped me by accident and as I turned she said excuse me. My response to her was, no worries, you are just pushing me to do something I need to any way. As I got out of line, I could see the dishes just up ahead. I turned the corner and right there in front of me were over 80 full bowled wine glasses. I had to have them all, (I mean just in case a few broke I would have back-ups, no?). I quickly found boxes and started packing them in. A few broke at the register so I was given a discount, (at the dollar store? Who’d of thunk!) The guy didn’t even look to see how many he just took off $10 and I was out with 78 beautiful wine glasses that I still use 5 years later for parties and my wine club. The moral of this story? While the dollar store seems the most unlikely place for most things remember that the majority of their products come from very reputable companies and distributors. Antoneo, on a recent trip to the east coast we decided to have a picnic lunch with some wine. We had plastic cups but wine in plastic is ugly. As we were driving I spotted a Dollar Store. I recalled your comment and sure enough two nice wine glasses for $2. Thanks for your tip. Great info Joe. I bought my Schott Zwiesel glasses at Crate and Barrel and they are fantastic, high quality German crystal, and about 1/3 the cost of Riedel. Also, I found that something around 18oz. is an ideal size for all types of wine. Is there anything more annoying than getting a 5 oz. pour into a 9 oz. glass, lol? my wine glasses with “salt”! It takes all the odors out of the glass and I wipe with a clean white towel. it vigorously, then rinse with more hot water. Then the wine has the aroma and taste of the grape! Okay, so where did you get this idea? I will give this a try. I also want my wine glasses to look brilliant. Does this process do that?